Mercedes team boss Ross Brawn has said they face a "difficult decision" over the future of Michael Schumacher. Mercedes have offered McLaren driver Lewis Hamilton a contract and some senior Mercedes figures believe Schumacher, 43, who is said to want to continue, should retire. Hamilton is also considering an offer to remain at McLaren. "Mercedes are faced with a thorny dilemma on the subject of Michael Schumacher's future. 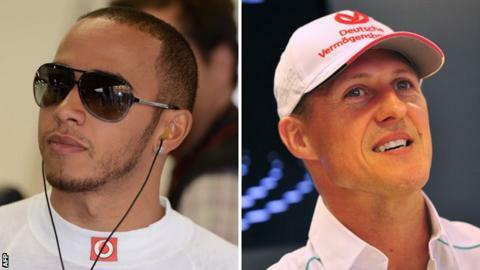 "One thing is clear - they want Lewis Hamilton. They have offered him a deal and, if he signs, one assumes Schumacher will be ushered towards the exit door as he is out of contract and his team-mate Nico Rosberg, who is 27 to Schumacher's 43, is not. "But what if Hamilton says no? "Schumacher, who is a marketing dream for Mercedes, has upped his game this year and has actually out-qualified Rosberg eight to six so far. "But he's a long way from the driver he used to be in his pomp, and he continues to show the signs of ageing - such as in Singapore on Sunday when he performed the latest in a series of embarrassing rear-end collisions with other drivers. "So do Mercedes drop him anyway and take a promising talent, such as their protege Paul di Resta? Or stick with the promotional benefits for another year or so?" "The decision for Michael to stay or not continue is a difficult one," Brawn told BBC Radio 5 liveBreakfast. "Obviously he's very involved in that decision, and discussions are ongoing at the moment. "Michael has been a huge asset to the team, he's really taken us forward. I do think Michael contributes an awful lot." Seven-time world champion Schumacher, who has registered one podium finish since coming out of retirement in 2010, has previously insisted he has yet to make a decision on his future. But it is known that Mercedes are keen to sign up Hamilton and, with Schumacher out of contract at the end of the season, it is likely Nico Rosberg will stay, as he is under contract for 2013. Rosberg is seventh in the championship with 93 points, compared to Schumacher's 12th place and 43 points, but this year has been the veteran's most convincing season since he returned to the sport. He has out-qualified Rosberg eight-six so far but has had the worst of Mercedes' unreliability. However, Schumacher has also been involved in two collisions in which he crashed into the back of another car after misjudging his closing speed, the most recent in Singapore on Sunday. Brawn added: "I think we will have something to say in the next few weeks or months. Then all will become clear. "I think any ambitious team looks at the top drivers and we're an ambitious team. But I think there's an awful lot of speculation." Hamilton, 27, is understood to be undecided on which of the two teams he will drive for next season. When asked if he would like the British driver in his team, Brawn said: "He's a very good driver. A very good driver." McLaren have continuously insisted that contract talks with Hamilton are ongoing and are preparing for the 2013 season with the "assumption" the 2008 world champion will stay. BBC Sport understands Mercedes have offered Hamilton a bigger salary than McLaren, whose first offer to Hamilton was a significant cut on his current salary. McLaren have since increased their offer to try to fend off the interest from Mercedes. Sources close to Hamilton accept that the pressure is on for him to make a decision and that he is likely to reach a conclusion within the next few weeks.